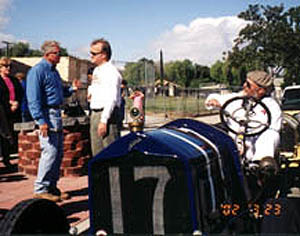 We've made appearances at car shows, race tracks, and at car club meetings for several years. Lately, we've found ourselves in front of the camera as well. Phil Harms said "If we don't do this, no one ever will." So we wrote the book Real Road Racing. It chronicles the annual race events from 1909-1919. Right up Wilshire Boulevard, you can drive the route today. Phil is no longer with us, but I created this video to recount the events that stirs so much passion. I've also been making Automotive Book Reviews for the YouTube channel and having some fun with it. They are all on the Book Reviews page. 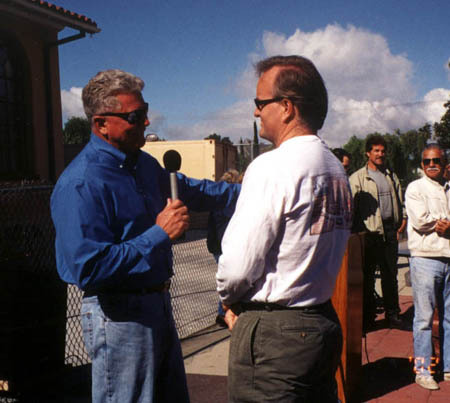 In 2002, we met with the Huell Howser Show on the circle at Corona. While there is no online video at their site, you can order the video through there and enjoy at your leisure. For the Corona appearance, we had a 1916 National race car along with a 1915 Mercer out for a few laps around the Grand Boulevard circle. This was the site of racing in 1913, 1914, and 1916. Huell is the genuine article, very focused. One of his producers has created a video documentary of Where They Raced. This documentary is not a Huell Howser production. And sadly, Huell has passed away. Ask me in person what I think of the project. Our Where They Raced DVD attracted a lot of attention and won the prestigious Motor Press Guild Award for Best Audio/Video Presentation, 2013. It also claimed the 2014 Golden Wheel Award at the International Reel Wheel Film Festival in Knoxville, Iowa. 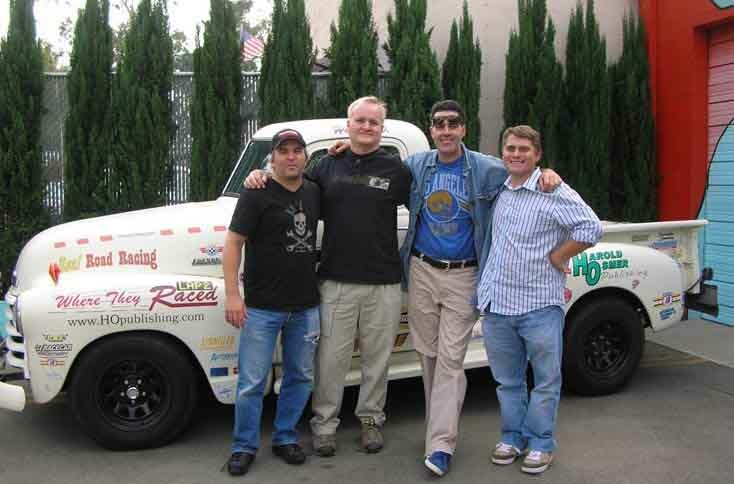 Adam Carolla had us out to his studio shop for an interview about the Where They Raced LAP2 documentary. A sit down chat with Adam is a raucous affair. We met all the guys and had a great time talking with them. Adam is brighter than he sometimes lets on and I think it throws folks when they meet him. We got along just fine and even had a chance to show off the truck. Being in Southern California has it's advantages when making appearances with celebrities. Jay Leno is one of the most well known car guys in the area and having the chance to get on his Book Club was especially interesting. 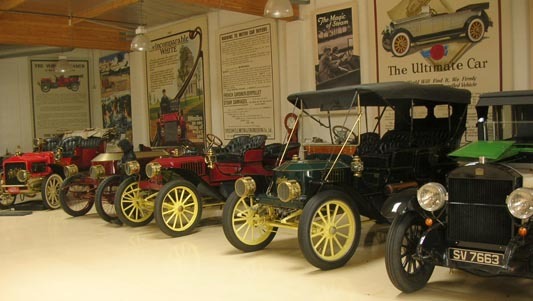 Through a variety of car events over the years, we've had the garage tour a couple of times. Getting an invitation to sit and chat about a topic we share a passion for is quite another deal. 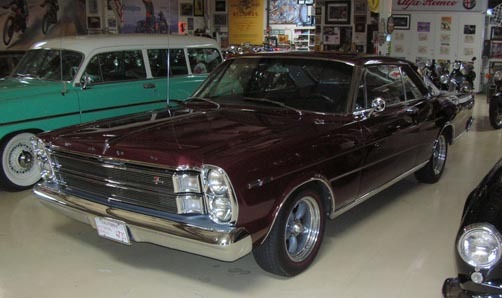 Jay's 1966 7-Liter Galaxie 500 caught my eye of course, as we have a '66 in our garage. His has a little more prep than ours. 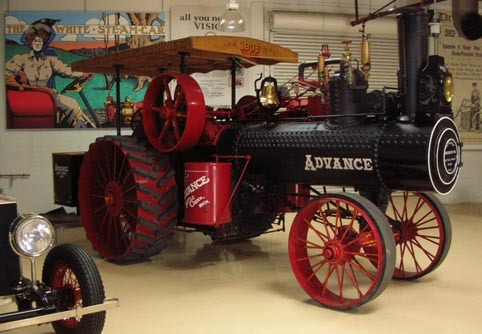 If you ever get a tour, you can't help but notice the incredible collection of steam powered vehicles on display. All of them are in operational condition and steam is Jay's favorite mode of power generation. Jay made a point of telling us about his big tractor. He said it takes about two hours to gather enough steam to make it run. We didn't ask how long it takes to cool down. One more thing. As Jay and I were going off into the library, he asked if my wife wanted to join us. I told him no, she isn't overly impressed with cars or celebrities. Not missing a beat, Jay said, "I'm not too impressed with celebrities either." Hey check this out! It's not a car guy appearance thing, but Southern California people will recognize Dr. George Fishbeck. He was a longtime weatherman on the Los Angeles TV scene and practically invented the game of weatherman shtick. Born in 1922, he witnessed the 1937 Hindenberg disaster from his home in Lakehurst, NJ. 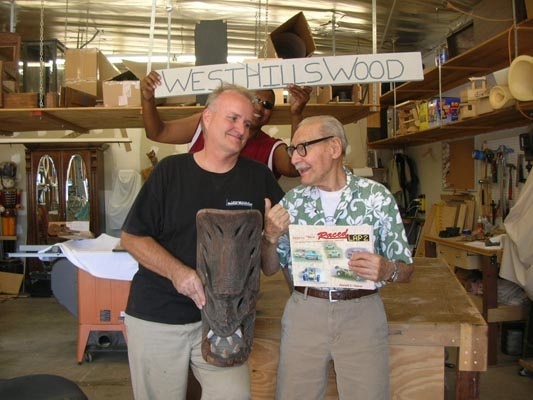 He had a tiki mask from his travels in the woodshop with a broken jaw. I made the repair and his friends brought him by for the pickup. What a pleasure to meet the man.He passed away two months later.